We’ve come to the end of the book. Have you been waiting? Are you holding your breath? Are you standing at the edge of your dream trying to decide if now is the time? If you’ve followed through this entire series on Holley’s book, You’re Made for a God-Sized Dream, you already know what you need to do. It’s time to take the step off the edge and into the unknown. It’s time to put your dream into motion, to move from believing to seeing. You already know what awaits you. You know that you’re going to have to face the chihuahuas of fear that will be your constant companions. You know you might face opposition from unexpected places. You know that you might be the only one in the room passionate about this dream. You also know that you were made for this. You know that all the experiences you’ve had up until now have been preparing you for this moment. You were created and placed on this planet for such a time as this. It’s your time to shine. Perhaps you’re a little like me. Have you had the dream for a long time but years and seasons have seen it moved to the back-burner? Your dream baby is back there somewhere…it isn’t fresh anymore, but it still burns inside you. You’ve been in a holding pattern for quite some time. That’s me, too. I was part of the launch team for You’re Made for a God-Sized Dream. Holley asked our group what our dreams were, and she walked us through a lot of these exercises and gently pushed us out. My dream of publishing a book on raising a traumatized child was there then and it still is now. It wasn’t time then for that particular dream to take flight. I watched as others from the God-sized Dream Team saw their dreams come to fruition, and I felt denied. When would it be my turn? Recently, I was at a large conference and one of the speakers, Albert Tate, said this, “You may have been delayed, but you have not been denied.” He was talking about dreams and encouraging those of us who have had our dream or vision sitting on a shelf, gathering dust, to not abandon that dream…fulfillment is on the way. The time for your dream will come because it doesn’t originate or end with you; it’s all about the Dream-Giver. So I want to say the same to you. Is it your time, sweet friend, to reach for the dream…to blow off the dust and step forward? You can hold my hand if you need to because I’m blowing the dust off my manuscript and starting to work on it again, and I could use a hand-holder. Is it your season? Is it time RIGHT NOW to get on board with that dream? Does it need to marinate a little longer? That’s valid, but don’t let it discourage you. Be discerning! There is a great cloud of witnesses cheering you on. The world needs you to do this. Your country, your city, your neighborhood, your friend needs you to do this. You are part of a greater puzzle that we haven’t seen the picture for. Only you can add your piece. We’re all waiting to see you step off that cliff and fly. At a conference years ago the speaker asked us, “What’s the one dream that makes your stomach churn and your knees shake? What’s that dream that appears to be so big, it’s larger than life?” It scared me to even allow the dream to play in full-color in my mind. It was beyond what I thought I could ever do. It scared me more than I care to share here. The speaker then said, “This dream–the scariest one–is given to you by God, Himself. And, with His help, that dream will become a reality.” Her words made complete sense to me. If it wasn’t God-sized, it wouldn’t be scary. If it was a dream that was easy to achieve, that didn’t require God’s assistance, it wouldn’t be scary at all. It wouldn’t take much effort, and it wouldn’t feel like much of an accomplishment when achieved. But, if it’s a dream from God, it’s big and it can be scary. Afraid. It’s probably not a word most of us delight in. I would venture to guess most of us despise it. There’s no doubt, we’ve all felt it. We’d do about anything to escape it. Whether it’s in seeing a scary movie, or facing the unknown, or walking through a difficult experience, feeling afraid is real. But, the reality is, it doesn’t have to paralyze us. Oh, it wants to, but we don’t have to let it. I believe the enemy of our souls wants us to walk around filled with fear. Because when we are–when we are afraid–we aren’t much of a threat. We shrink back in fear, we stay where it’s comfortable, we find ways to justify not pursuing our God-sized dreams. And when we do, we and the rest of the world miss out on the dream within us that’s meant to become a reality. This is when “do it afraid” becomes our mantra. It’s no wonder I connected with Keri Lynn’s story in chapter 10 of You’re Made For A God-sized Dream, by Holley Gerth. Chapter 10 contains stories of real-life God-sized dreamers like you and me. In reading them, you’ll probably connect with one or two also. I too, like Keri, find that God prompts me to keep on dreaming and to pursue that dream He’s given me. You know, that scary one. And yes, I’d have to agree with her, the dreams just get bigger and scarier. Scarier, not to stop us, but to face the fear and grow through it. Interestingly, the fear won’t leave until we do. When we believe the truth above and trust God is bigger than our fear, taking one step forward in faith causes the fear to shrink. Sure, it may be uncomfortable, but the more we step out, the less uncomfortable it becomes. As God guides us, we continue to move forward, listening for His whisper, focusing on truth, and taking one step at a time. Soon our God-sized dream will be in reach! In what ways are you “doing it afraid?” How can you encourage another to keep moving forward in his/her God-sized dream? How can you encourage yourself? That God-sided dream–that scary one–is within your reach as you and God partner together. Keep “doing it afraid.” I’m cheering you on! Our part is not control. It’s not results. It’s obedience. It’s intimacy with the One who asks us to trust him even when nothing makes sense. Even if we don’t attach a number to it, we can still come up with other ways of being able to check the “success” box on our lives. Happy family. Flourishing career. Deep spiritual life. Yet God calls us to see success differently. He doesn’t measure or define it like we do. Rather than seeking a result, He invites us to see success as part of a relationship. To say it simply: true success is being a good and faithful servant who brings happiness to our Master. “Well done, good and faithful servant! You have been faithful with a few things; I will put you in charge of many things. Come and share your master’s happiness! (Matt. 25: 21) What does this look like in our daily lives? First, the word “good” is about our character. It describes who we are. Thankfully, we don’t have to make ourselves “good.” Indeed, there’s no way we even can. We’re sinners who need a Savior. Yet when we receive what Jesus did for us, we do become “good.” And we bring our Master joy as we live out more and more of who we already are in Him. As Paul said, “Only let us live up to what we have already attained” (Phil. 3:16). The word “faithful” describes our actions, what we do. In other words, being faithful means being trustworthy and obedient. God can count on us to say yes to what He asks of us and to follow through on it. Will we mess up? Absolutely. What counts is that when we do, we come running back to our Master and let Him help us. In essence, success means yielding to the ongoing process of Jesus transforming us in every area of our lives. When we do so, we bring Him joy. It’s beautiful the way this verse describes it: “enter into the joy of your master” (Matt. 25:21 NASB). In other words, the joy of the Master in His servant is ongoing. Success means yielding to the ongoing process of Jesus transforming us in every area of our lives. Many of us go through life believing that God barely tolerates us— that He’s just hanging on until we get to heaven when He can actually enjoy us. But that’s not true. You can (and do) bring God joy right now. What this also means is that if you are obedient, you cannot fail. Oh, it may look like it in the eyes of the world at times. It may seem as if your dreams go wrong. But if you are faithful to your Master, then you are a success no matter what. We can simply get up each morning and pray, “God, I am Your servant. Do with me what You will. 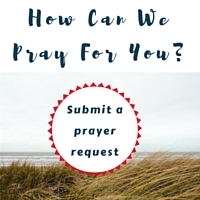 Use me as little or as much as You want.” In ways that can’t be measured, beyond what we can count or even imagine, He will answer that prayer. And when we are home with Him, we’ll celebrate together—forever. Will anyone care about my dream? Do they want to hear the desires of my heart? Will they respond in love or totally shoot my dream down before it even gets off the ground? But part of growing up is allowing yourself the chance to dream. I need to remember dreams are not just for children, but for all of us. In You’re Made for a God-Sized Dream, Holley Gerth outlines some disclaimers she wishes she would have known before she started dreaming. Chapter 6 outlines all five disclaimers, but I literally sucked in my breath when I read, “You will sometimes feel alone.” I knew Holley was describing me. Dreaming is an individual activity as you begin the process of visualizing, writing down your thoughts and bringing to life your deepest desires. Naming your dream out loud is a step saved for another day. 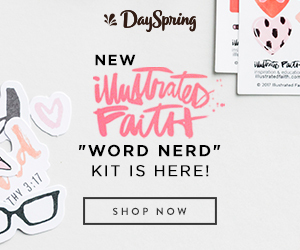 Because in the naming and claiming you are telling the world (or your best friend) that you believe the dream in your heart is ready to be set free. It is the step that many of us do not end up taking because our dreams are very personal. When you name and claim your dream, you are ready to set it free. No one will ever love your dream the way you do. Since dreams are so personal, the emotions, vision, and processing occur internally. Others cannot feel the depth to which you feel, but it’s not because they don’t try. In 2015, I opened my heart to dream about traveling to a new country on a mission trip. When the process started, butterflies wreaked havoc inside my stomach. Then an internal battle of talking myself into it, out of it and into it all in the same breath came next. Finally, with the support of a group of like-minded people surrounding me, I said it out loud for the first time. There is freedom in naming your dream, sharing it and allowing others to encourage you. This all began in the Fall of 2015. In March 2016, I found myself flying toward Nicaragua with a group of other dreamers from my church. I literally cried when we landed, overwhelmed by the reality of the goodness of God. During the week-long mission trip, there were many moments that I experienced and processed on my own. The nature of my dream looked different than the others in the group. Time alone actually provided me with the God time I needed to understand all He had done and was doing during the trip. God was always present. From the tiny seed of an idea to the fruit, it bears when we follow God’s lead, He never leaves our side. And God cares about it more than we do. The “it” refers to our dream or more fully finding our center in God’s love. Saying “no one will ever love your dream the way you do” rings true until you remember God always cares. God is always with us, so that means even when it feels like it, we’re never really alone. Sometimes the feeling that we are alone is actually an invitation to stop and recognize his presence with us. For all of you dreamers out there, dream and dream some more. For all of you dreamers out there, dream and dream some more. Let the challenges become markers on the way to your dream. When you feel alone, know God is always present and can’t wait to see you take the next step. Your dream will bear fruit even when your original dream looks different but the result is more than you ever imagined. God is that good! Invite Him to walk this new beginning with you and know He is there by your side. /FIR/ noun. An unpleasant emotion caused by the belief that someone or something is dangerous, likely to cause pain, or a threat. Fear. The dreaded emotion that so often glues our feet to the floor and prevents us from moving forward with our God-Sized Dreams. Our palms become sweaty and adrenaline pumps through our veins. Or am I the only one? One of the things I fear is doing something I consider to be a risk. As someone who generally takes calculated risks or avoids them altogether, God is showing me that every dream He places in our hearts will require us to be bold and courageous. 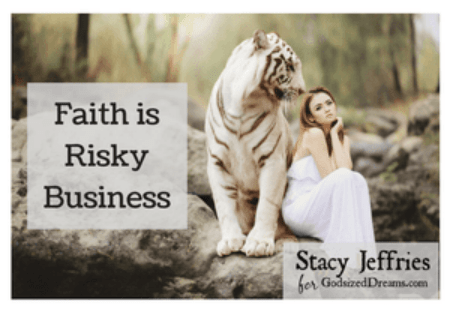 Whether that means praying boldly over your husband and children, applying for a job that is out of your comfort zone, or setting a new goal, it will require some level of risk. We know it is a God-Sized Dream because we can see the gap between our capabilities, resources, etc. and what is needed for the dream to come to fruition. God wants to use this to grow our faith, while we may allow fear to paralyze us and stop us from dreaming. …Look at my past. I’m not good enough to do this. …The risk seems too great, so I shouldn’t even try. …This dream is too small for God to care about, or too big for Him to handle. …Someone else has spoke negatively about my abilities, and maybe they are right. …I don’t have what it takes to fulfill this dream, not like she would. What does fear look and sound like for you? I would like to tell you that fear won’t happen on your journey, but fear is a part of life. Sometimes fear of a hot stove saves us from an injury as a child. But what about the fear that tells us we can’t do all that God intended for us to do? How we choose to handle that fear is what matters. Holley reminds us that we serve a God who has called us to slay giants and walk in authority. Faith without risk isn’t faith. It’s just facts. Overcoming fear is part of the journey to achieving your God-Sized Dream. Someone once told me that fear is the last tactic of the enemy. If you are experiencing a fear block on your dream journey, focus on what the Word instructs us to do when we feel fear. Have I not commanded you? Be strong and courageous. Do not be afraid, do not be discouraged, for the Lord your God will be with you wherever you go. We are called to continue walking, knowing that we are not alone. We can choose to give in to the fear, or we can choose to fight it. Let’s be brave and continuing taking steps toward accomplishing our dreams. We can also combat fear with prayer. A few months ago when I was fearful and anxious, I reached out to my prayer warrior friend for encouragement. She prompted me to pray this prayer. I found comfort in saying it, and have repeated it on more than one occasion. I share it with you, and I pray that it encourages you as you overcome your fears and pursue your dreams. Fear, you are not my friend. You are not my comforter. You are not my protector. I renounce you and I break your hold on my life from this moment forward in Jesus’s name! Holy Spirit, fill me up with your presence and in that place fear occupied, release your love over me to take its place. AMEN. Praying that you will walk in boldness and take possession of the land! When I was in Junior high I had a bully. She and her minions would follow me home relentlessly almost every day after school in the 7th grade. She would taunt me, call me names, and throw things at me. At school, I did everything I could to avoid her. She was very mean, and I dreaded our daily interaction. I would even try to go home different ways to avoid her, but somehow she would always find me. One day after school, I was walking to my grandmother’s house with my best friend, Leslie Parker. This bully and her followers approached me, and they immediately started talking trash. This time she wanted to fight me. I was scared. My friend saw the fear on my face as I held back my tears and tried not to make eye contact. My friend’s instincts kicked in, and she got between me and my bully. She told this girl that if she wanted to fight me that she was going to have to get through her first. I had never seen my best friend look so fierce. She was adamant that this bully-girl was going to have to fight her first. Her face was beet red, and she was getting in this girl’s face. The girl and her posse finally decided to leave. I stood there in awe of what I had just witnessed. Not only was my friend one of the nicest, most non-violent people you would ever meet, but also, no one had ever stood up for me like that. We eventually moved, and I no longer had to deal with that bully. But trust me, there were other bullies in my life. The definition of a bully: a person who uses strength or power to harm or intimidate those who are weaker. 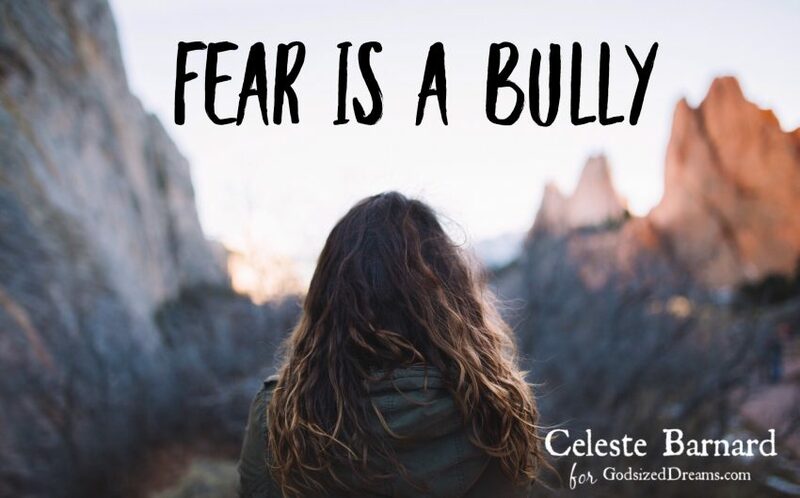 In chapter five of the book, You’re Made for A God-Sized Dream, Holley Gerth describes fear as a bully who doesn’t fight fair. And there have been many times I hid…and he won. I think about how much time I wasted, listening to this bully, fear. When God first called me to speak, I was so nervous and full of fear. Quite honestly, I still get nervous; the only difference is that I step out and face my bully instead of running and hiding. And I’ve learned that God steps in when my bully, fear, tries to push me around and He tells my bully that he’s got to go through Him first! When we are feeling afraid, just like my friend Leslie Parker did, God sees that fear in our eyes. He sends His Holy Spirit to step in and say, I will fight for you. Stop Feeding the Fear…Let it starve! But sometimes we fatten it up even more by giving it treats. Every time we believe a lie, it’s like throwing a bone to fear. We indulge it with insecurity or offer it a bit more of our attention to nibble on. Fear eats it all up, and then we’re surprised when it grows. No more! I’ve made it my mission to specifically do that thing that scares me because what I’ve realized is that there’s a reason the enemy is trying to keep me from doing it. He wants me to stay afraid and then I won’t do what God’s calling me to do. The enemy is sneaky. He knows that our calling affects not just us, but so many others. If we let fear lead, we won’t step out. Do it afraid! Don’t spend one more day listening to the lies of the enemy! Face your bully and trust God to give you what you need as you need it! Will God Make My Dreams A Reality? Holley Gerth’s book, You’re Made For A God-Sized Dream will always hold a special place in my heart. You see, this is the book that started it all. My mom (Holley) had donated a ton of copies of this book to the house I was living at. After reading this book, I found her number and just wanted to thank her because the book had helped me so much. She asked me to hang out, and the rest is history. I had a dream that seemed so small and silly, and so I tucked it away deep in my heart. I tried to avoid thinking about it because I feared that I would fail and be rejected. Through this book I laid everything out before God, admitting that I had a dream of being married, for the very first time. The church had drilled it into my head that I should be content with where God had me. If I had a dollar for every time I heard the phrases, “Give it to God” and “Date God”, I’m pretty sure I could have paid for my entire wedding. 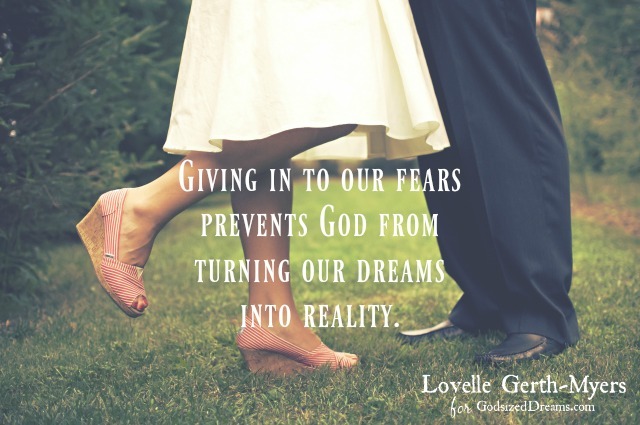 So I lived in fear that I was letting God down by desiring a husband. I didn’t have anyone to sit me down and walk me through the emotions that came with loneliness. Looking back I can’t help but smile because my mom was parenting me through her books before she even met me. The adversary used to hold me captive with fear. I feared that I was damaged goods and not good enough to be loved by anyone. I eventually stepped out in faith and let people get to know me. The real me. They saw the good, the bad, and the ugly. I felt naked, exposed, and vulnerable. It scared the heck out of me. Underneath my “independent” facade was a girl who wanted to be loved so badly it hurt. A girl who couldn’t believe a guy chose her. I was in such disbelief that I would frequently find myself saying,“promise you aren’t going anywhere?” a million times a day. I’d trusted God, let people in, and was terrified of letting them go. Underneath my cemented outer shell was fear that someone would walk away when they saw what I saw. I thought the couple that wanted to be my parents would walk away when they found something better. I thought they deserved something better. God walked with me through my fear and slowly, I began to trust. I didn’t have to ask that guy if he was staying because I knew he was here forever. He even gave me a ring to prove it. I could show the roller coaster of emotions I had to my parents as we learned to live life as a family. I knew that they would love me through my trauma. I stopped living the lie that I wasn’t good enough because my parents and husband treated me like I was. Slowly, I began to see myself the way God does, and I’ve never looked back. I am so thankful that I didn’t give in to my fears because If I had, I wouldn’t have a mom, dad, husband, and daughter. I’d still be lonely, looking at that book, wishing but never trusting…and not allowing God to make my desires a reality. I would have missed out on His best for me. “He didn’t mean to kill Patty. He was shooting because he was afraid.” These astonishing words of forgiveness tumbled out of my friend’s mouth as we sat on the carpeted hallway floor outside of the chapel. She had just sat through a meeting on the logistics of heightened security and traffic flow needed for the funeral of her precious husband, killed in the line of duty. Her voice was soft and calm. Undeniably sad and dazed, but certain. She spoke of the shooter’s family and the pain they must be enduring. 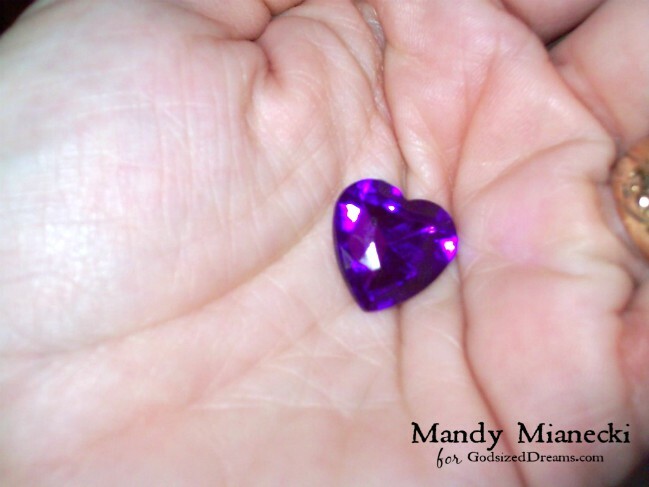 In her time of deepest sorrow, my sweet friend kept her heart open. She spent the subsequent days, weeks, months, even years, in unspeakable grief, a range of emotions I will never fully know; yet, she kept squeezing her babies tight…and each person she encountered. Yes, we know to expect that bear hug when she greets us. My heart rejoices that her new husband now receives those bear hugs, and her his in return. She kept her heart open. There is a certain kind of destructive marriage…the kind that cries out for annulment, and my friend found herself in one. My friend with a bigger heart than just about anyone I know. A spirit so alive and adventurous. Children so precious. She—they—were being crushed. Resource after resource for improvement exhausted, laden with trauma most would not believe existed, she made a brave choice. She kept her heart open. Knowing neither would heal together, and perhaps him ever, she fought for her kids and began a new, healthy life. She secured avenues of support, a home she made beautiful and safe for her babies, and an income to support them. And then she completed certification as a yoga instructor. My brave friends are an example to me. They endured pain that few can understand, and they’ve continued on in ways that bring life to others. Rather than being bitter, they are better, and their light helps those around them to be better too. They kept their hearts open. I’m focusing on keeping my heart open too. I’m writing from a place of personal upheaval as my family goes through many changes. I’m walking with my children as they learn to manage the stress and pain that comes with relationship changes that are beyond their control. Addresses are different. Income is different. We wonder why God allows what he allows. And yet. Their spirits are sweet. Their precious personalities are blossoming as they journey with courage through some hard days. We’re keeping our hearts open. It’s hard to remember God is loving when the world feels like it’s collapsing. Allowing myself to be consumed by anger and bitterness would be easy.Click To Tweet But, that still, small voice inside keeps niggling at me. To keep my heart open. Maybe you’ve been there? Maybe you’re there right now. Whatever you’re going through, will you continue to make the brave choice to keep your heart open? Social media overwhelms me. It’s a loud, loud place. And unless you have good boundaries, one minute of scrolling can somehow turn into an hour. It seems like everyone has something to say. Everyone wants to be noticed and heard. They want to know their voices matter. I love chapter 3 of You’re Made for a God-sized Dream because it reminds me I don’t have to shout, wave about, and do cartwheels to be known. I am. I’m known for taking short fasts from social media when I feel like the voice of the world is louder than God’s. I also do it to bring some peace into my life and refocus on exactly what God has called me to. I can get caught in the comparison game fairly quickly. When I feel the murkiness of discontent rising, I know it’s time to put social media in a timeout. By the time I realize the need for a fast I’m usually soul-tired, weary, and ready to quit…because most days I don’t have the time or energy to figure out what I’m having for breakfast much less how I’m going to achieve my dream. Once Instagram and Facebook are in their corners, my world gets small, my quiet time has more meaning, and my focus and excitement returns. It’s a truly amazing thing! And then I remember why God doesn’t require us to strive. Let’s just say if striving were an Olympic sport, I’d be a gold medalist. Seriously? Like it’s up to me to get it all done and accomplish it all in my strength. When’s the last time I parted a sea? Or rose someone from the dead? God doesn’t need my help! Could God really only require me to be faithful? That’s it? Seems too easy. Faithful, quiet, and small are not words the world we live in knows too well. But they are exactly why we can rest easy…and exactly what we can be when we know we are His. Our influence and reach may at times extend quite far. We may find ourselves with a microphone on a stage and that’s fine, but it’ll be God who puts us there. I know it’s silly, but I find rest in not having to be the biggest and best. I find freedom in being able to just be me and know that it’s ok and good enough. The quiet life is not the life the world values and appreciates, but it’s certainly a different kind of ambition…and one I live for. I want to challenge you to go deeper, not bigger. What are some ways God may be asking you to trust Him with your ambitions? 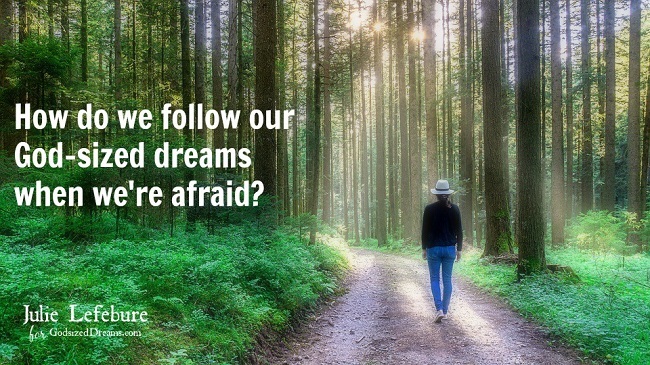 How do we move forward with our dreams even when we have uncertainty? Dreams are the aspirations or goals we hope to achieve in, with, or through our lives. They often start out strong, seemingly attainable and somewhere along the way, we begin to doubt, fear, and question. We tend to look at heroes of the faith as just that – heroes. Yet if we were to look into Scripture, most of these heroes of the faith were just like us. In the beginning, they struggled with fear and doubt. They were heroes because they forged ahead anyway. Moses implored the Lord for more information. He wanted to know more about the details. God often reveals part of the dream, the full dream remaining a mystery. Every now and then, He pulls the curtain back a bit, letting us in on another piece to the puzzle. We learn along the way that His thoughts are not our thoughts. His ways are not like ours (Isaiah 55:8). I believe God lets it be that way, even makes it that way, because it draws us closer to him. Our dreams may be elusive, but he is ever-present. Our dreams may challenge our sense of safety, but he is our ultimate security. Our dreams may catch our interest, but he’s the One who relentlessly chases our hearts. And He assures us as well that He will go with us and be with us always. 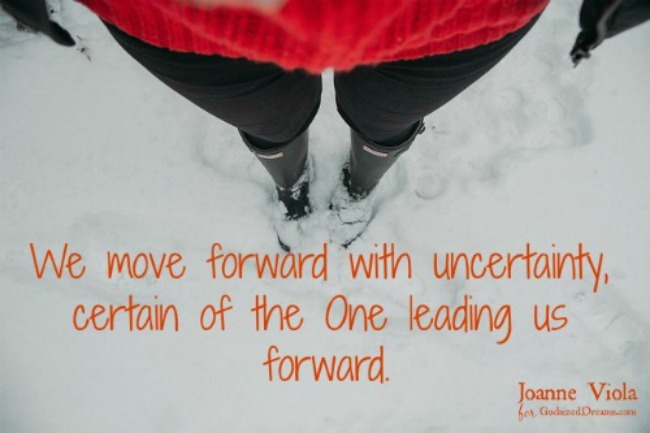 We move forward with uncertainty, certain of the One leading us forward. You may just have a God-sized dream if it is leading you to greater dependence on God. Your dream will bring you joy in time. But the primary goal of your dream is to bring you into a deeper and more intimate relationship with God. So keep moving forward. Wait patiently. The dream will come to be and it will be right on time. Have God-Sized Dreams delivered to your inbox.